This photo shows the view from inside the Large Underground Xenon (LUX) dark matter detector buried deep below the Black Hills of South Dakota. Image released Oct. 30, 2013. A new experiment buried deep underground has proven itself to be the most sensitive dark-matter detector ever built. But the first results from the high-tech instrument have turned up empty in its search for elusive dark matter, scientists announced today (Oct. 30). Housed 1 mile (1.6 kilometers) underground in the Black Hills of South Dakota, the Large Underground Xenon (LUX) experiment's sensitivity makes it better at seeking out dark matter than any other detectors built for that purpose, LUX officials said. Although the powerful dark matter detector has just completed its first run, LUX has not yet found conclusive evidence of the elusive substance. Scientists think that dark matter makes up the majority of the matter in the universe; however, it cannot be seen or touched. Astronomers detect dark matter because they have seen its gravitational pull on galaxies and stars. By running experiments like LUX far underground, scientists hope to shield the dark-matter detector from everything but WIMPs — weakly interacting massive particles that are thought to be the leading candidates for the particles that make up dark matter. "LUX is the quietest place verified in the world," Rick Gaitskell, a Brown University physicist, said during a seminar today (Oct. 30). "That's how far we've had to go in order to be in a position to look for these WIMPs." LUX is particularly adept at searching for low-mass WIMPs, which are predicted by some theoretical physics models. WIMPS are extremely difficult to find because they rarely interact with ordinary matter, except through gravity, LUX officials said. Scientists think that WIMPs can be both low-mass and high-mass, and LUX has an enhanced sensitivity to low-mass WIMPs. The dark-matter detector recently completed its first data-collecting research run. Through the course of the approximately three-month WIMP search, scientists did not find signals of WIMPs, although previous experiments with other detectors predicted that they would. 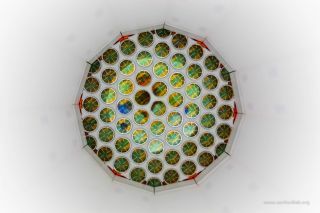 "Three candidate WIMP events recently reported in ultracold silicon detectors, however, would have produced more than 1,600 events in LUX's much larger detector, or one every 80 minutes in the recent run," LUX officials said in a statement. "No such signals were seen." LUX houses a 6-foot-tall (1.8 meters) titanium tank filled with liquid xenon and cooled to minus 150 degrees Fahrenheit (minus 101 degrees Celsius). The xenon tank is surrounded by rock and a tank of water. If a WIMP comes into contact with a xenon atom, it will emit light and electrons. The electrons are pulled upward and release more photons. By recording both the photons at the collision point and at the top of the tank, the detector is able to pinpoint the locations of the photon signals and measure their brightness.